But before we get to my ramblings about DWTS, we have socks!! Recently, Cristi published her Red Dwarf Socks pattern. Since I had some fabbo STR Heavyweight from MDS&W, I knew the two were made for each other. I cast on last Monday night at my monthly SnB and finished them up (after two days on the couch with that nasty, nasty cold I had) Thursday morning and wore them to my twice-monthly SnB. They got lots of oohs and aahs from my fellow knitters, including several who immediately wanted her blog address to get the pattern. I LOVED this pattern. It was a ton of fun to knit and stayed interesting throughout. I know I’m a little biased, since Cristi is such a dear, dear friend, but this really was a great pattern. I almost wish she had hung on to it to submit to Knitty or MagKnits, because it is totally worthy of being published. And yes, that top picture IS the front and back of the socks at the same time, thank you very much. 🙂 I took ballet for exactly one year as a kid, and that’s the only thing I can still do – torn my feet out pretty much to 180 degrees. Just ignore the fact that my ankle is rolling a bit. OK, this is when I start to hate seeing anyone go home – I’ve loved all four of these couples since the beginning, and I really don’t want any of them to leave, but there aren’t really any other options, are there? I’m going with Ian and Cheryl in the bottom two along with Laila and Maks, and I have the feeling that Ian’s breakthrough came just a little too late and he’ll be done. May 14th, 2007 | Tags: Dancing with the Stars, FOs, Knitting | Category: Misc. Excellent socks!! Lovely colorway too! Gah, gotta get mine done! As for DWTS…sigh, Ian, yes, he peaked too late! I think it’ll be between Joey and Apollo! I do like Laila though..hmmmm tomorrow nite will tell! Gah! Of course the finale is the same time as NCIS’s finale..so..not..fair! Eeee! 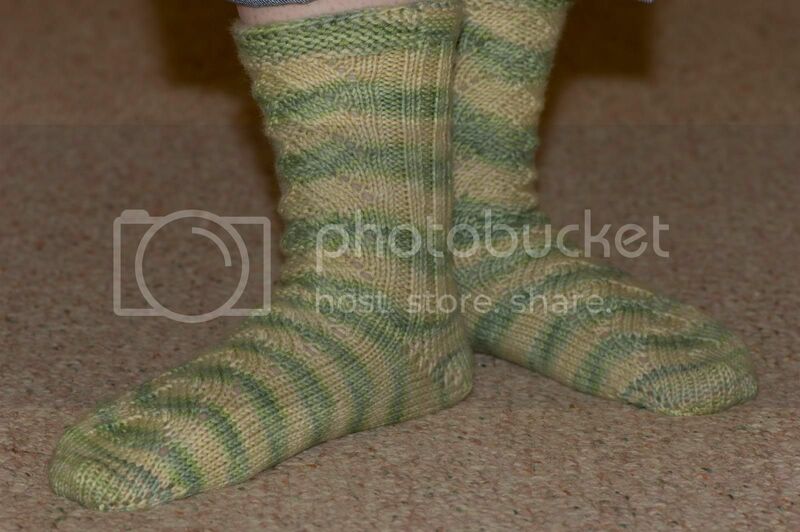 Finished sock photos! I’m so excited. I know I shoulda held onto it but I don’t know. 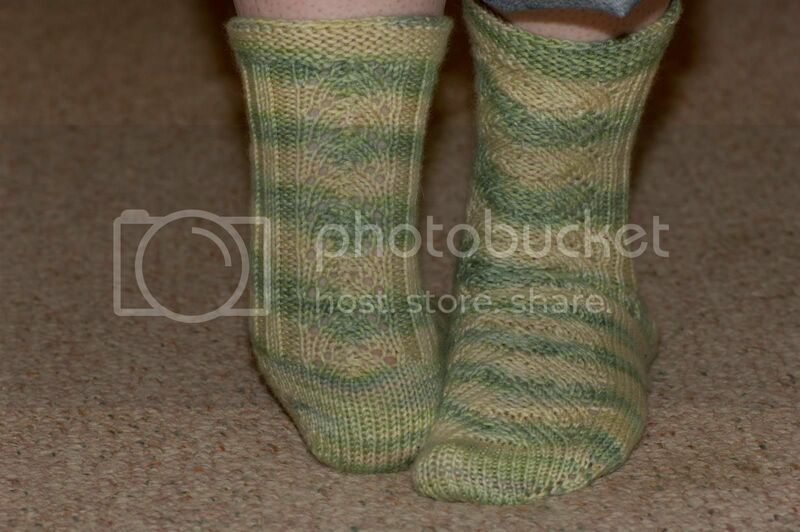 There’s those Wick socks in No Sheep For You so why would Knitty want it right? Socks look fabulous!!! Can’t quite get over that first pose…incredible talents 🙂 Love the STR colorway too. I too am worried Ian will be going home (but I think Cheryl has a strong fan base, okay, maybe Ian does too …note top two last week). But if Ian doesn’t go, who does?? I want Joey and Laila to stay (I really like them both). And as great as Apollo is, for some reason, he just bugs me a tad…so I guess I hope he goes. Very cool!!! I need to try those out! Love the socks! I’m going to have to print out the pattern and give toe up another go. They’re too pretty not to. I’m cheering for Laila as she’s the only female left. I’d hate for it to come down to a “Sausage Fest”. Sigh. So, if i’d vote off one guy…it would have to be Joey. There’s something arrogant and smarmy about him that rubs me the wrong way. For some reason your blog posts always run into your side bar for me so i miss the last few words of each line. Which STR colorway is that? I’m so glad you post a play-by-play on “Dancing…” – I got sucked into it awhile back, but I have a knitting group on Monday nights and always miss it!! awesome socks – great idea to show off the front and back!! In the first round, I think Len gave Ian a sympathy 10 to make up for last week. He was much better, but not as good as the others. In fact, I think the judges were wall a little 10 happy. The dancing was great though. I’m so impressed with how everyone’s improved. I’m in love with Apollo though! Oh, I wanted to add that Laila was phenomenal, in the second dance, I agree she held her own against the professional dancers, and I loved the butterfly, it really worked in the routine, and that purple dress was gorgeous on her. …ps – is that the same colorway I bought too? The socks look neat! Love the colors.